I think it’s borderline on the way-obsessive side but I can’t be too sure. I’m too busy kissing him and making him sit like a human to sort out my potentially-psychotic emotions. I don’t understand why people aren’t obsessed with their dogs. You know, those people who are kind of weird and have dogs yet never even mention them or touch them or anything? It’s really sad. Your dog isn’t an accessory. It should be like your child. It should be better than your child. I’m weird. My mom says I shouldn’t have kids and I couldn’t agree more, but I really enjoy having a dog-kid. He doesn’t do anything bad except bark and occasionally lick weird things, but I love him anyway. I’ll never have to worry about him becoming a drug addict or a prostitute or a scary, creepy man who wears socks with sandals and offensive cologne and hangs out around middle schools. I’ll never have to take him to sports practices or pay for college or any of that stuff. He never needs new clothes, the hippest techie gadgets or anything. He’s like, totally perfect. And he has his cute little front paw and I like putting it on my leg so he sits up straight like a human boy would if a human boy sat with his arm sticking straight out. And I like squealing when he does cute things which, let’s be honest, is all the time so I’m perpetually making high-pitched squealing noises which drives my family batty. Oh, and I kiss him ALL. THE. TIME. You know when people put you down in the heat of the moment, like that bitchy friend you have who poops on your happy parade when you scored a bitchin’ bag for cheap (“are you sure you can afford that?”) or when you take a great, big bite of something delectable, like a giant piece of pizza and someone says “I just lost ten pounds and basically was asked to be a model” and you’re like, SERIOUSLY?? I’m in the heat of the moment so WHY would you say this to me now?!?! Um, he’s been sitting like a human having his Shakespearean-hair brushed out by his mother who has been squealing over his cuteness for the last hour. I’m pretty sure I’m okay. And what’s the worst that could happen? I turn into a dog? That’d be awesome. I’m not even worried. Now, leave me alone so I can go back to smelling his pads which smell ironically like Fritos. Don’t tell me they don’t. He’s perfect, my Frito-pawed baby. And for people who don’t have dogs in your life, I’m sorry. And for everyone else, I made brownies. Completely irrelevant to dogs and not to be served to dogs, but delicious brownies nonetheless. So when you’re done hugging your dog you can eat some and maybe give one to your annoying mortal frenemy who has kindly reminded you you’re a freak. But you already know, so maybe you shouldn’t give her one and keep them all to yourself. Good plan. 1. First, prepare the mint layer. In the bowl of a stand mixer, beat together the butter and peppermint extract until creamy, about a minute. Gradually add the powdered sugar, about a cup at a time, until the mixture is light and fluffy but not completely stiff like a buttercream. You want it a little on the softer side. If needed, add a couple teaspoons of milk. Stir in the green food coloring to your desired shade. 2. Spread the mint mixture evenly onto the cooled brownies in the pan. Place in the fridge to set for about 30 minutes-1 hour. Next, prepare the chocolate ganache shell. 3. In a microwaveable bowl, melt the chocolate chips on high for a minute. Add a splash of oil, stir, and zap for an additional 30 seconds or so until the mixture is completely melted and smooth. Spread the mixture evenly on top of the mint layer. Then, sprinkle the ganache immediately with the crushed grasshopper cookies. Allow the ganache shell to harden and set for another 30 minutes or so before cutting into bars. Store airtight for 1-2 days. I like mine chilled in the fridge. 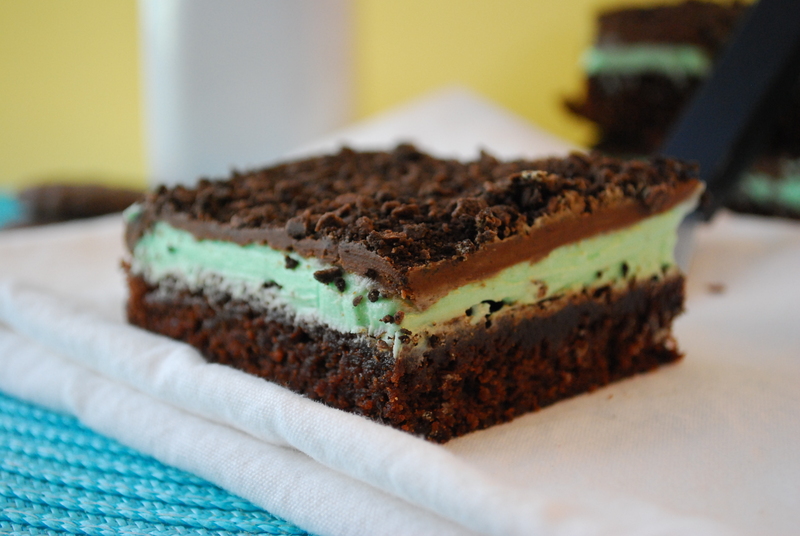 The combo of the fudgy brownie, the cool mint layer and the chocolate shell makes these brownies explosive in flavor and texture. I especially love the crushed Thin Mint cookies on top–like cookie sprinkles. Amazing!! They’ll probably want to make you hug your dog. Just sayin’. Well, I don’t have a dog, but I DO have a toddler, whose fingers usually smell like Cheez-Its. Kinda the same thing, yes? And oh my goodness, these brownies look awesome. Seriously awesome. I’m sitting here drooling and wondering if I have all of the ingredients in my kitchen so I can make these like NOW. 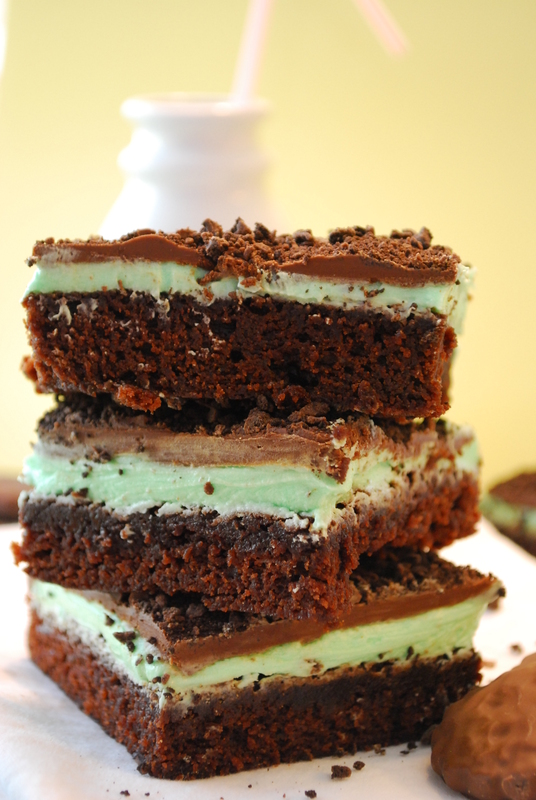 That mint layer looks to.die.for. And the brownies look so ooey-gooey. YUM! Please, PLEASE–make me a drink and I’ll make you these brownies. Deal?! I was completely obsessed with my golden retriever…….and I am telling you from experience, dogs are so much more fun than kids! 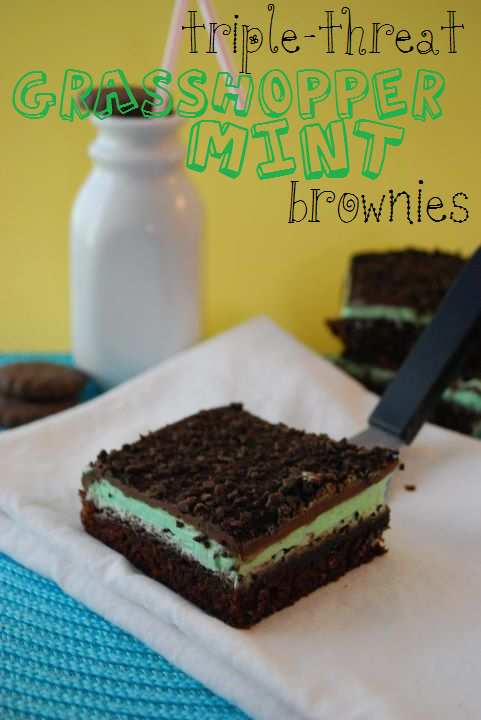 Now, excuse me while i repeat “I don not like mint brownies” until I am convinced enough not to make these and eat the whole batch. Oooohhhhoohoh this is the your subconscious and I am convincing you to make these br0o0o0ownies because they’re really g0o0o0od. We could totally be friends. (Wait a minute, is that a stalkerish statement?) My dog is my second kid. Totally. When I get home she gives me a LOOK and I know she needs a hug. So I let her jump up and hug me. I totally get everything you said, especially the part about people who don’t treat their dogs like kids. We know some people whose dogs live outside. Um, what’s the point of having a dog? If you don’t like hair, dog smell, and chewed walls GET A FISH.